A small low-speed centrifuge with memory for 10 programs, alarms for imbalances, overheating and overspeed and comes with an automatic lid release. The centrifuge is ideal for routine separation of blood, urine or cells. Compact and robust small centrifuge, which is ideal for low-speed routine centrifugation. Commonly used in the fractionation of blood samples and simple precipitation of biological samples. Automatic lid release and vivid end alarm for easy retrieval of samples. Supplied with and angle rotor including 6 of aluminum sleeves for 15 mL tubes. A low-speed benchtop centrifuge with soft start/stop for gentle acceleration and deceleration. It comes with memory for 10 programs and alarms for imbalances, overheating and overspeed as well as a automatic lid release. Possible to choose between a fixed angle rotor for 16x15 mL or swing-out rotors for 6x50 mL or 8x15 mL tubes. 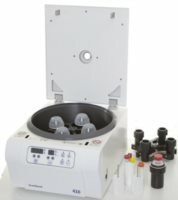 The centrifuge is ideal for general laboratory applications including biological sample separations of cellular materials, blood, urine, sperm etc. As well as clinical applications including PRP, PRF, lipid cell separation and stem cell isolation. In addition, it is also recommended for low-speed gentle centrifugation of microbead containing microplates and gentle soft spin-down or washing of primary cells and cell lines. Compact benchtop centrifuge with maximize capacity of 400 mL. A seperarate button for soft start/stop function to achieve very gentle acceleration and deceleration. Funised with unique airflow design and antivibration structure to minimize heat and noise generation. The lid drop protection ensures easiness and safety when loading or unloading samples. A large assortment of rotors, buckets and adaptors for microtubes and all sizes of tubes up to 100 mL.